Bay Area residents that have to travel on San Francisco’s Bay Bridge had to endure worse-than-usual traffic this past Sunday evening after a group of cars temporarily blocked the eastbound side of the bridge. What for? To do donuts, of course. SFGate reports the incident occurred just after 6:00 pm on Sunday, with as many as 50 cars said to have blocked traffic so a group of hooligans could show off on the bridge. 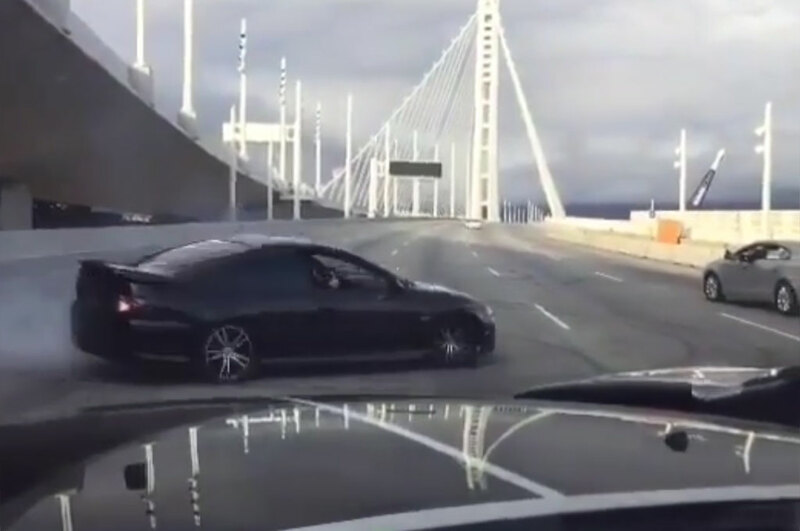 Only a few cars are seen in a video posted to Instagram, which clearly shows a 2004-2006 Pontiac GTO burning rubber just outside the Bay Bridge’s Yerba Buena tunnel. This isn’t the first time a major Bay Area highway has been shut down for hooning. In 2013, a group of cars stopped traffic to perform stunts in the middle of Interstate 880 in Oakland. A similar incident occurred last November on the same stretch of highway. As of this writing, the suspects are still at large. The California Highway Patrol is investigating the matter. Click here to see the video for yourself.